Silymarin: There’s nothing silly about it — your liver and skin will take it seriously. Silymarin refers to an extract from seeds of the Milk Thistle plant. The extract contains three bioflavonoids: silybin, silydianin, and silychristin. These effects appear to be due to silymarin’s antioxidant and immunomodulatory activities and its ability to block fibrosis. Other studies indicate that silymarin can provide substantial protection against cancers induced by ultraviolet light. Silymarin has low solubility and is poorly absorbed when used orally. 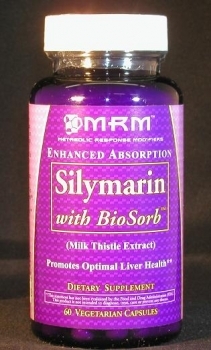 BioSorb Silymarin is formulated to increase the solubility, thereby increasing its absorption by 500%. Silymarin refers to an extract from seeds of the Milk Thistle plant Silybum marianum. The extract contains three bioflavonoids: silybin, silydianin, and silychristin. Milk Thistle seeds have been used for centuries to treat liver diseases, and that is how they are used today. Medical studies show that liver damage from alcohol, drugs, pesticides, some poisons, and hepatitis can be prevented or repaired with silymarin extract. These effects appear to be due to silymarin’s antioxidant and immunomodulatory activities and its ability to block fibrosis.